Great zoom ... especially the greetings tricked my brain. Terve! Happy you guys won! Great quality demo! enjoyed that one very very much on the stream! Maybe showing something interesting is more win-worthy than being super-polished-boring-gray. Great track and trippy flow, with a few seams that didn't bother me much because the whole presentation has that unique Adapt style. Deserving Winner! Zooming credits were the best part. Other scenes felt unbalanced sometimes. I really loved some of the transitions! Cool stuff! Visuals are messy, and there was really not that much interesting stuff. I'm very surprised this won! So my favourite demo actually won for once? That doesn't usually happen. It was pretty painful to watch. Nice flow from start to finish, but the greetings part was pretty triggering to watch. Some scenes are a bit empty. Otherwise great :-) Congrats on winning! probably the most "demostyle" demo in the compo, bit messy but still done well. Great feels, music and beautiful zooming. The ending was a bit rushed, but a clear winner in my mind still. The zooming concept is old but super fun. Nice zoom effect. And thanks for not using UE/Unity while winning Assembly. The zoom effext in liquiXion was cool, so why not make it a central theme in a new demo? Best of compo. Liked the general just keep zooming idea although it, but couldn't there have been nicer things to zoom into and what's with the randomness to those reflections. Very good soundtrack but the trick became boring rather soon. Also the whole scroller/greetings part is a big no. Extreme endless zoomer in a party trance world! Nicely spatial feeling, at times it felt like flying at the compo. Have to point a critical finger toward those unpolished triangle worms or whatever that just pile up there toward the end. 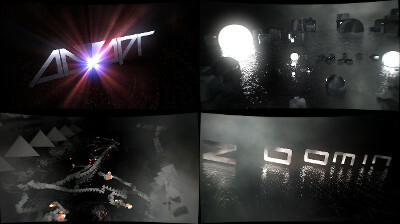 Of all the zooms in the demo I liked the cubes+light spheres -one most. i like the concept of a modern endless zoomer a lot but some of the scenes and/or the postproc werent that pretty to look at. but its fresh and I found the tune to be fitting and well done, so thumb away! the best Adapt demo so far, well done! Okay, so the zoomer was a cool idea, but the rest felt like a ball of random wrapped in rendering artifacts and ugly. Too messy overall, but some nice scenes. My favorite was the glowing balls in the water. Decent music. If Adapt have taken their best scenes from each of their demos and composed it in a more coherent style they would have ruled. A piggie. Cool tune and I thought demo was pretty cool too. Awesome visuals and sound but the camera paths and some animations would have needed a bit more polishing. Like a visual Shepard tone gone haywire. A good example how execution details don't matter when the audience loves the concept. What a mess. Didn't like the music. a bit rough around the edges (both literally and figuratively) but very enjoyable on every level. This is an interesting approach but it is visually so-so. Too messy with strange transitions which just don't make any sense. Also I really try to but I can't feel the zooming, there is too much randomness. Even a fractal zoomer is more "zoomin" like that. I don't understand why it won. Has a couple of pretty cool scenes, but most of it I thought was rather forgettable and generally not very pleasant to look at. However, among the top contenders probably the least niche. A bit messy at times but enough good looking parts make up for that, the greetings look particularly nice. Music is pretty cool too! Hmmm... meh. It's a nice concept but I just can't get over that combination of "aliases like hell" and the far too low res ground map. Kudos for doing something different, feels right and consistent to me. I also like the ever-evolving soundtrack, gives it that very demo-ish touch. Hm. I like the idea, and the greetings part is really nice - but overall, the demo just doesn't look very good. Scene composition, colors and direction are not my cup to tea. Piggy. As a long term Adapt fan this has all the best parts of that Adapt style. So fresh and edgy, finally a new idea! Well deserved win. Great show, nice flow and direction to it, cool music if a bit crazy at the end. The saving grace is the zooming effect, which is done to perfection. But, sorry to say, the rest is rather ugly, and there is very little sense of depth cues, due to misuse of shadows and vanishing lines in almost every scene. The music is very forgettable. Basically an average demo from 2005 that will be remembered for the zoom mechanics. The zoom-effect is totally hypnotising! stuff i enjoyed the most at Experience so here, your thumb, now go. page created in 0.021966 seconds with 15 queries.